2019 St. Patrick's Day Facts and Figures, with Refernces! About half of all Americans plan to celebrate St. Patrick's Day. 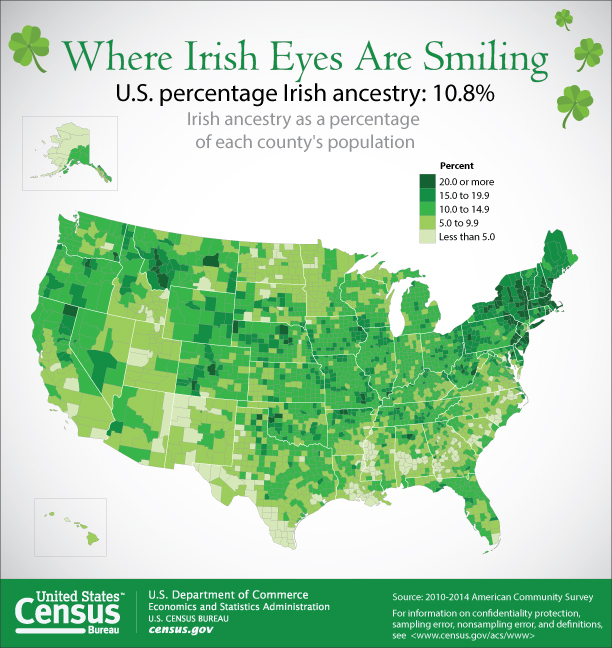 Irish Americans make up about 10% of the US population, at around 35 million people who can claim Irish ancestors. Spending has been fairly consistent over the past 10 years, dipping in the 2009 recession, but otherwise around $35 per person. Another 13.5 million Americans claim at least some Irish ancestry. 35 million Americans or about 11% of the population can therefore claim to be of Irish descent. Most live in the northeast, from NJ and NY north to Maine. Massachusetts can claim to be the home to the most of Irish descent. It is traditional to wear green and eat corned beef and cabbage. 26.4 billion and 2.3 billion U.S. beef and cabbage production, respectively, in pounds, in 2010. Irish beer, particularly Guiness is popular. Guinness sales soar on St. Patrick’s Day. The shamrock, pot-of-gold and leprechans are associated with St. Patrick’s Day. .
Leprechauns are also symbolic of Ireland. They are small Irish fairies, dressed like the Keebler elves, with pointed shoesa green vest and hat. Saint Patrick was not Irish, he was from Scotland. St. Patrick’s Day is an annual feast day always on March 17th, celebrating the patron saint the day is named after. St. Patrick is credited with bringing Christianity to the Irish people. It is an Irish tradition to pinch anyone who is not wearing green on St. Patrick’s Day. Irish immigrants first started celebrating St. Patrick's Day in Boston in 1737. The first St. Patrick’s Day parade was held in New York City in 1766. Anyone can be Irish on St. Patrick's Day by wearing green and joining in the celebration. For many years, the official and traditional color of Ireland and St. Patrick was blue. Green was actually considered unlucky. The Irish Presidential Standard is still blue. In Chicago every year, the Plumbers Local 110 union dyes the river one of the cshades of green associated with Ireland, “Kelly” green. The dye lasts for about five hours.